We thought we could please all of our visitors with a fresh DJ set mixed by Remaniax. Containing some of the hottest tracks of the moment and some exclusives, including a brand new remix we did for Tom de Neef & Laidback Luke which will be released shortly. You will also hear the upcoming Döner Digital Records release, Mosquitos Malditos (scheduled for april 2008). 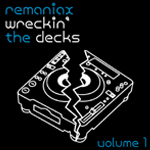 You can download Wreckin’ The Decks Volume 1 here. Enjoy!